The mother of crippled murder suspect Shelton George, called ‘Boorie,’ insists that her son is innocent of the slaying of waitress Debra Blackman. She claims that he has been attending court for the past eight months on a robbery charge, and was never in hiding. George was arrested on Wednesday in his mother’s Better Hope, East Coast Demerara (ECD) home. He has been wheelchair-bound, after he was shot in the back while in Suriname. Police have reportedly tied him to the murder of waitress, Debra Blackman, who was gunned down in August, 2014 in a D’Urban Street restaurant. Police are also treating him as a suspect in the July 29, 2014 killing of 40-year-old Bernadette Campbell, who was shot in a minibus by a hooded gunman during what is believed to be a robbery. 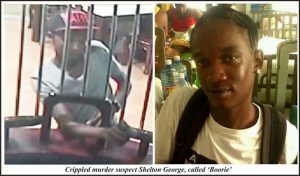 According to information, “Boorie” was shot twice to the back in Suriname by Kellon Hinds, who was hiding out there after murdering Sherwyn Barrow. Barrow was slain execution-style in May 2015. After shooting Boorie, Hinds came back to Guyana in September 2015 and was gunned down in retaliation for the death of 24-year-old Sherwyn. Police had released a photograph of the gunman who killed Blackman. But Shelton George’s mother, Rosaline Munroe, yesterday insisted that her son is not the man in the bulletin. She said that in September 2015, police charged him for armed robbery and he was remanded. According to Munroe, he remained on remand until June 2016, when he was released on bail. Mrs. Munroe said that he has been attending court and she was surprised when police came to her home on Wednesday and arrested him for murder. Shelton George’s mother said she was not at home at the time, but was told that police searched the premises, took her son’s cell phone and then took him to Police Headquarters, Eve Leary. Mrs. Munroe had since retained a lawyer for her son. While the one of the suspect’s Facebook profiles shows the tattooed Munroe posing near a huge stack of cash, his mother insisted that he is not a criminal. She said that the photograph was taken in Suriname, and the money belongs to an individual with whom her son was employed.